If traveling in more than one Schengen Country, please make sure that your longest stay (counting by night spent) is in Italy. If the days of stay are the same in more than one country, please be sure that Italy is the first country of entry. Once received by the Visa Application Centre, applications will be sent to the Embassy of Italy in Singapore the next working day. The application cannot be submitted earlier than 90 days before the expected date of arrival in Schengen Area. ***The Embassy of Italy reserves its right to request additional documents. PLEASE NOTE ***Those requirement are only for Short Stay. Less than 90 Days. ***For Long Stay Application the following requirments are not valid since this category is handled by the Embassy of Italy itself. Filled in and signed application form. Passport (Original and Copy) with minimum two blank pages facing each other with a validity at least of 3 months. If Singapore PR Holders must present Re Entry Permit (Original and Copy) valid for at least three months after the intended visit to the Schengen Area. Flight Itinerary (Confirmed booking of the return flight – not paid ticket.) If travelling around the Schengen area all trains, car rentals or flights from country to country must be provided. Accommodation for the entire stay. All nights must be booked. Should mention if covering the entire Schengen Area or worldwide. Minimum coverage of 30.000 Euro or 50.000 SGD (Euros, USD or SGD currency accepted only).Please provide the policy wording with full details about your insurance. The letter from the insurance should mention the name of the applicant and should match the travel dates. Letter of Acceptance from the University in Italy that MUST be in original with an original signature. Last three months of personal bank statement with transactions of applicant. Not overseas accounts are accepted. ***This requirement is only for Short Stay. Less than 90 Days. ***For Long Stay Application please contact the agency directly. Applicants cannot apply more than 90 days before departure. NOTE: All Fees would be collected in SINGAPORE DOLLORS and in CASH ONLY at the application submission counter. Note: In case the visa is denied the fees paid will not be refunded. The photograph should be not more than 6 months old. It should have white background only so that features are distinguishable and in contrast against the background. It should be in sharp focus and clear. It is essential that your mouth is closed and your teeth are not visible. It should be 4 cm X 5 cm. Photograph can be taken with headgear, the main characteristics of the face must be apparent from the photograph. Chin, nose, eyes and eyebrows must not be covered; the forehead should be uncovered to the extent that the shape of the face is apparent. It should be without hat/cap. Hairs must be behind the ears. 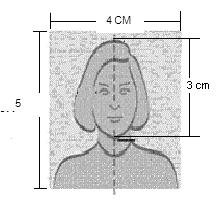 The photograph must show facing square on to the camera, not looking over the shoulder or tilted, and showing both edges of the face clearly. If wearing glasses the photograph must show the eyes clearly with no flash reflection off the glasses and no tinted lenses (if possible, avoid heavy frames – lighter framed glasses to be worn). Make sure the frame does not cover any part of the eye. The photograph must show alone (no chair backs, toys or other people visible) looking at the camera with a neutral expression and the mouth closed. Scanned and colour photocopies would NOT be accepted.